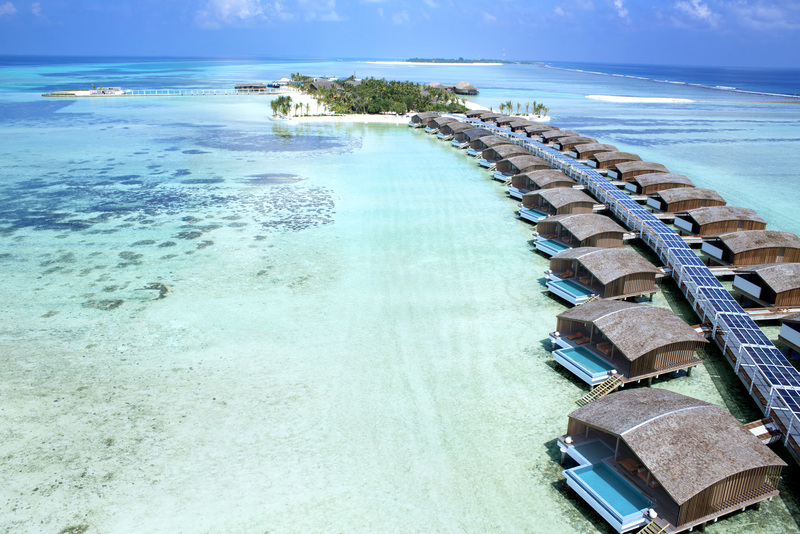 The eco-friendly resort, Club Med Finolhu Villas has received an International Design award in the category of “Best Beach Hotel Design” by the International Hotel and Property Awards 2015. The award hosted by a leading interior design magazine in United Kingdom called ‘Design Et Al’, presented awards in various categories to the best hotels around the world. Known to be an excellent honeymoon resort, Finolhu Villas by Club Med is situated on Gasfinolhu Island, just a 40 minute speed boat ride away from Ibrahim Nasir International Airport. Featuring 52 Eco Nature villas that are set on the immaculate shores of the pristine island and over the turquoise lagoon on stilts, each with its own pool and a terrace. The all-inclusive resort was designed by the Japanese Architect Yuji Yamazaki and a French Interior Designer: Meriem Hall. Each villa has been constructed to ecological standards and a contemporary design that blends in perfectly with the elegant nature of the stunning resort. Built on a 5 hectare crystal lagoon, the environmentally-friendly resort has a welcome lounge, a gourmet restaurant & bar that offers exquisite cuisines, a tennis court and fitness room, a relaxing spa that provides an ideal wellness journey in the Sunny Side of Life, and a pontoon for recreational activities. Located just 5 minutes away from Club Med Kani Resort, Finolhu Villas is a resort that uses 100% solar energy, with about 4,000 solar panels in the holiday island. Guests that stay at the holiday resort Club Med Finolhu Villas have full access to their neighbouring resort for dining, activities and all the facilities that are offered. Maldives is a tropical paradise that is popular for being an amazing holiday destination. You can easily visit this island nation for an unforgettable vacation, through our team at Travel Centre Maldives. To book a stay at this beautiful resort that has won the top design award for a beach hotel, do contact us (Travel Centre Maldives).